Over the past several years, I have made it my mission to encourage people to visit Haifa. Writing over and over about my adopted city’s unique history and culture—and running a food tour that celebrates local mom and pop restaurants operated by Arabs and/or Jews—I am an eager promoter of the many delights in this Northern Israeli metropolis known for inclusivity. But I’m not just a cheerleader for my own city. I feel a natural camaraderie with others working to blaze trails in their own towns, and I find it particularly moving when those individuals are hell-bent on preserving and honoring the past for future generations. 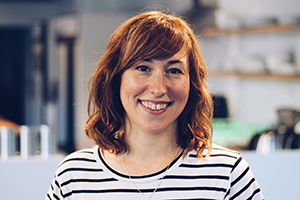 The story of the Museum of Jewish Montreal and its director of food programming, Kat Romanow, are shining examples. Romanow, 32, is no stranger to food: She grew up in and around her grandfather’s Italian bakery in Montreal, where she was part of a large Italian-Catholic family. After being drawn to Judaic studies as an undergraduate, she went on to earn a master’s degree in the subject from Concordia University in Montreal. She wrote her thesis on Mimouna—the Moroccan Jewish open-house celebration following Passover that is known for its sweet delicacies. Ultimately, Romanow converted to Judaism. The Montreal native is now instrumental in preserving her city’s varied Jewish heritage. Together with Sydney Warshaw, she conceptualized The Wandering Chew, a project that operates Beyond the Bagel, a Jewish food tour of the city. Warshaw is another food powerhouse with culinary family history, including a great-grandmother who helped edit the popular Montreal Hadassah cookbook called A Treasure for My Daughter. 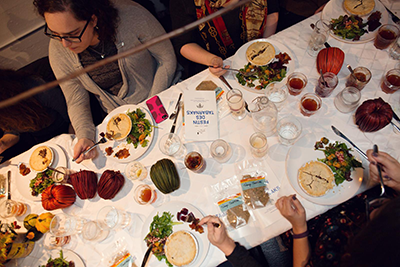 The Wandering Chew hosts heritage-based cooking workshops and dinners through the Museum of Jewish Montreal that explore lesser-known Jewish communities and their food (two good examples are Mexican Jewish- and Scandinavian Jewish-inspired meals). Romanow also runs Fletchers, the museum’s restaurant, which turns out modern pan-Jewish cuisine during the day and provides space for The Wandering Chew events at night. The museum got its start online in 2010, when Executive Director Zev Moses created virtual exhibitions meant to explore the rich and varied history of Montreal’s 90,000 Jews, including its large Sephardic population. Today, the museum is located in its own purpose-built space. The staff is made up of bright and ambitious scholars and research fellows. Museum staffers do not merely tell the story of Montreal’s Jews—they are growing it; researchers are actively collecting personal immigration stories from the community. If you are from Jewish Montreal, go to their website and share yours as well. 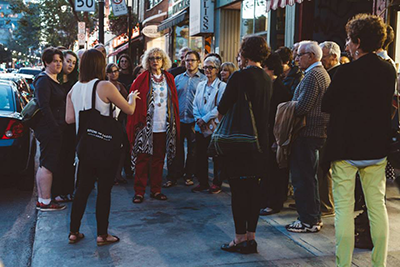 Beyond the Bagel tours explore Montreal’s rich history of delis and bagels as well as the stories of the neighborhoods themselves, and the people and cultures that populate them. For foodies, some highlights include: warring bagel vendors; Mrs. Whyte’s famous deli pickles; Romanian food; and babka. Some of the establishments visited on the tour have been operating for nearly 90 years. As the demands of creating programming for the museum increased, Romanow knew she had to recruit new guides to lead the food tour—but not without first training them extensively in the city’s Jewish history. The training program for new guides became the museum’s latest effort—the Jewish Food Fellowship. But Romanow is not just focused on the past. She is excited about Montreal’s evolving Jewish food scene. Photo from ‘Feast: Recipes and Stories from a Canadian Roadtrip’ by Lindsay Anderson and Dana VanVeller. Copyright © 2017 Lindsay Anderson and Dana VanVeller. Published by Appetite by Random House®, a division of Penguin Random House Canada Limited. Reproduced by arrangement with the Publisher. All rights reserved. In a large bowl mix together the water and the package of yeast. Let it sit for 5 minutes, until the yeast is activated–you’ll know it’s activated once the mixture becomes frothy. Add the sugar, vegetable oil, maple syrup and egg to the bowl and mix the ingredients until everything is dissolved. Mix in the salt and 4 cups of flour, adding it in one cup at a time. You should have a sticky dough that holds together. Turn out the dough onto a floured counter, sprinkle some more flour on top of the dough and start to knead it. You’ll need to keep sprinkling the dough with flour so it doesn’t stick to the surface that you’re kneading it on. Knead the dough until the it is smooth and elastic. Place the dough in a lightly oiled bowl, cover with a dishtowel or plastic wrap. Let the dough rise for 30 minutes. Just as the dough is almost finished rising, put three quarts of water and the honey into a large pot and bring to a boil. Preheat oven to 425 degrees. Punch down the dough and divide it into 12 equal portions. You’re going to shape each portion of dough into bagels by rolling each into an 8- or 10-inch rope, curve the rope around your hand bringing the ends together and roll it back and forth a few times to seal the ends. Boil your bagels for a minute and a half, flipping the bagels halfway through. Only boil three or four bagels at a time so as not to crowd the pot. Remove the bagels from the pot and place on a plate and let cool until they can be handled. 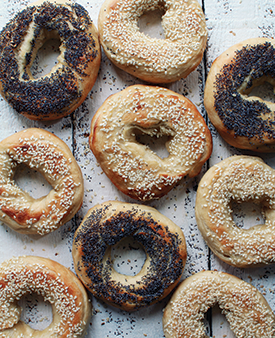 As the bagels are cooling, place sesame seeds and poppy seeds on separate plates. Cover both sides of the bagels in sesame or poppy seeds and place on a baking tray that’s been lined with parchment paper. Bake the bagels for 20 minutes, flipping them halfway through. The bagels should bake on the top rack for the first ten minutes and be moved to the bottom rack of the oven for the last ten minutes. The bagels should be golden brown with a few dark brown spots. If you’re not eating them right away, they can be frozen and warmed in the oven. If the fishmonger hasn’t already done this, remove the pin bones from the salmon fillets. Run your fingers along the top of the fish, pinch the end of the bones with tweezers, push down on the flesh with your other hand and pull the bone out. Repeat with all the bones. Stir the salt, sugar and steak spice together. Place the fillets on a large piece of plastic wrap. Spread each of the fillets with an equal amount of the salt mixture and pour ½ tablespoon of whiskey over each fillet. Place the salmon fillets on top of each other so that they’re touching, flesh to flesh with the skin facing outwards. Wrap the fillets tightly in the plastic wrap and place them in a bowl or dish with high sides to contain the juices released during curing. Weigh the fillets down by placing cans of beans on them or by weighing down a plate with a bag of flour. Refrigerate the salmon for 2 or 3 days, making sure to turn the fish every twelve hours. 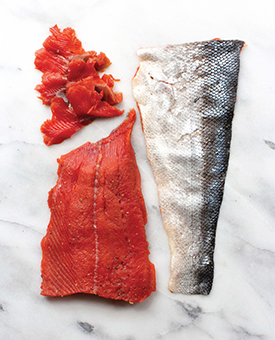 The gravlax is finished curing when the thickets part of the fillet feels firm to the touch. Wipe the curing mixture off the salmon fillets and using a sharp knife cut the skin off the fillets. To do this, keep the knife at an angle pointed towards the skin and use a slow back and forth movement to cut the skin away. The fillets will keep, well wrapped, in the fridge for a week.